During the cold winter months, it’s a constant struggle to keep the cold air out and the warmer air inside. Many homeowners park their cars in their garage hoping that their car will be warmer than parking it outside on the driveway, yet sometimes this isn’t the case. If you have your garage walls insulated but fail to insulate your garage door, your insulated walls are pretty much useless. Since the garage is typically the largest opening to the outside it’s important for it to be sealed and insulated. “Studies have shown that replacing an uninsulated garage door with an insulated one can reduce heat loss through the garage by more than 70 percent, especially if the walls of your garage are insulated.” It’s also important to note that having proper seals around the garage door is a big factor to the effectiveness of an insulated door. Having a good perimeter seal will also help keep leaves, grass and critters out of the garage. 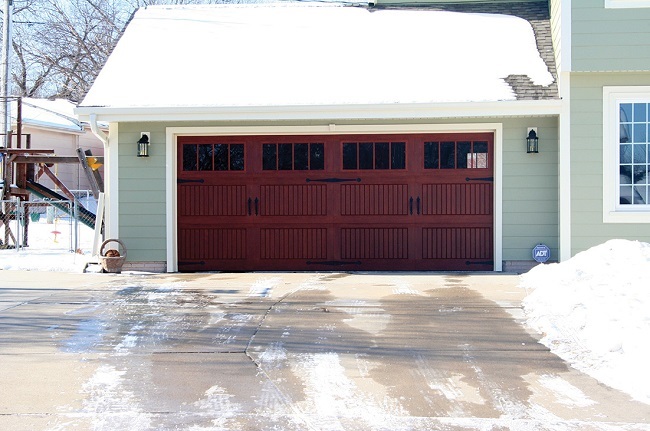 Do you store tools and equipment inside your garage during the winter months? It’s important to realize that very cold temperatures can damage certain equipment that’s being stored in your garage. If you really want to protect your belongings, we would recommend getting an insulated door and consider insulating the walls in your garage. The science behind this is that heat expands and cold contracts, which can in turn damage equipment. Having an area that is less susceptible to extreme temperature changes is a good place to store things like mowers, power washers and any other tools that use gels and liquids to keep them running smoothly. Very cold temperatures also can do a number on your car battery. One of the main reasons for auto failure is dead or near dead batteries. "When temperatures plummet, automotive failures skyrocket. Calls for battery jump starts and assistance with frozen locks are the top ranked reasons for calls to AAA," said John B. Townsend II, or AAA Mid-Atlantic's Manager of Public and Government Affairs. An insulated garage door is typically not as loud as a non-insulated door. This is because the insulation creates a sandwich construction between the metal which helps to keep the metal from rattling. Other ways to make your garage door less noisy is to make sure all the bolts, screws, hinges and other parts of your door are tightened and secure and to lubricate all the parts of your garage door. Instead of just a single layer of steel being used an insulated garage door uses a steel-insulation-steel construction. It’s two layers of steel with insulation in between each, which gives it a more durable construction. Having a garage door with a durable construction will also increase the longevity of your door. Nobody likes getting in a cold car. Having an insulated garage door can also mean a warmer car. One of the worst things about the winter is getting in a freezing cold car with a frozen steering wheel. Parking in an uninsulated garage or outside won’t keep your car warm. Since no one likes getting in a chilly car, try getting an insulated door.